Will Justice Prevail for Oscar Grant? July 5 March 4 Dennis J. Freeman1 Comment on Will Justice Prevail for Oscar Grant? Los Angeles-The anticipation of the jury verdict in a racially-charged, police officer involved shooting death of an unarmed black man in Oakland, California, has gripped the nation. Possible civil unrest and unruly disturbance is on the minds of every law enforcement agency from Oakland to Los Angeles should a jury absent of any African Americans, come back without a murder conviction of Johannes Mehserle, the white police officer who shot 22-year-old Oscar Grant to death as he laid face down at a train station. 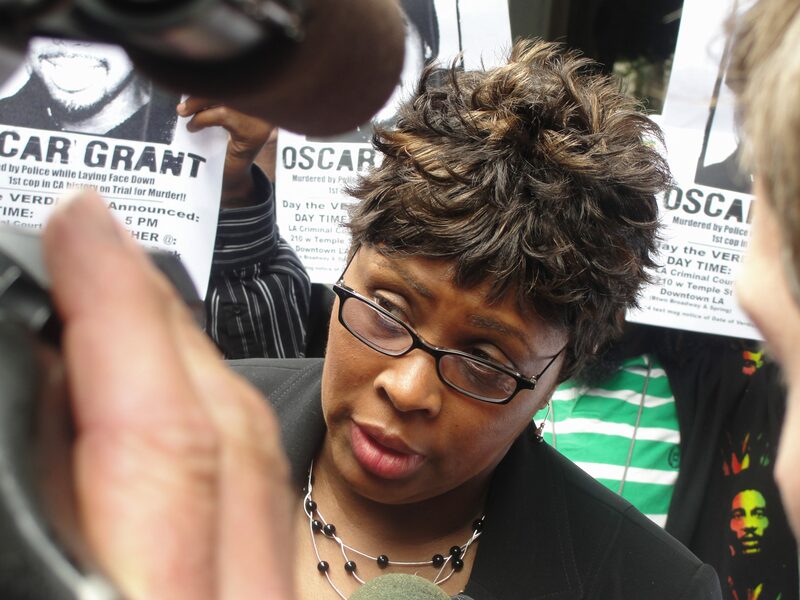 The family of Oscar Grant III wants justice served. Mehserle, a former Bay Area Rapid Transit police officer on New Year’s Day, 2009, was caught on video tape shooting Grant in the back at the Fruitvale BART Station in Oakland. His fate and justice now rest in the hands of 12 strangers. With the trial finally nearing the end, members of the Grant’s family are still emotionally shaken from the young man’s death. The trial has taken its toll on Grant’s family and friends. They appear to be physically and mentally drained from the whole ordeal. It has been especially taxing on Grant’s mother, Wanda Johnson, the past 18 months. Johnson was rushed to a Los Angeles area hospital after slumping over outside the courthouse from exhaustion. As the outcome of the trial near, community activists and organizations, such as the Los Angeles Coalition for Justice for Oscar Grant, has become daily staples outside the downtown Los Angeles courthouse. And now that the verdict announcement is imminent any day the national media has begun to trickle in. Mehserle is looking at substantial prison time, if he is found guilty of murder or 2nd degree murder. Mehserle testified that he thought he had pulled out his Taser instead of his service revolver. Prosecutor Dan Stein challenged Mehserle’s accident theory during his closing argument before jurors. “Acting from emotion resulted in the death of an innocent person,” Stein told jurors. During his closing argument, stein ripped the testimony of the three expert witnesses called to testify during the trial by the defense. Stein went after and painted a picture of questionable motives of the defense’s expert witnesses, whether they were driven to give testimony out of monetary ambition. One of the defense’s expert witnesses, Greg Meyer, has received in access of over $50,000 to show up on the stand and lend his expertise to jurors on the art of using a Taser. Meyer is a former LAPD officer, and is an advisor to Taser International. “If there is one thing that is clear in this case, there’s a lot of money to be made in this gig,” Stein said. Michael Raines, the defense attorney for former BART police officer Johannes Mehserle, tried his best to present a case of contradiction to jurors in the high-profile, racially-tinged criminal case that could plant a seed of reasonable doubt amid murder charges against his client. A well-known criminal defense lawyer, Raines has seen this scenario play out before. He has built his career on successfully defended peace officers accused of alleged misconduct, including the “Oakland Riders,” a group of cops who were acquitted from allegations of corruption and accusations of terrorizing black folks in Oakland’s urban community. In his closing statements, Raines tried to sway jurors with a different version of what took place the morning Grant died. Mehsrele shooting Grant to death in the back as the young man laid face down and unarmed, was not done with deadly intent, Raines said. Nor was it a matter of negligence. In making that argument, Raines told jurors that they could not come away with first-degree and second-degree murder charges against Mehserle. With Grant’s mother and other family members sitting in the courtroom, Raines also made it clear to jurors that manslaughter charges should not be up for consideration as well. Raines’ entire argument centered on the motives of Mehserle, whom he described as “being in a good mood” after arriving on the scene at the Fruitvale BART Station, where a fight had taken place minutes earlier. Raines suggested to jurors that Mehserle’s actions after the shooting was not consistent with someone who commits an act of malice or with intent. Grant’s character was, he said. Raines openly questioned Grant’s character, noting an altercation with police in 2006, which resulted in the dead man being tasered into submission. Stein dismissed the defense’s version of the truth. /while this shootig is tragic, i am always perplexed as to why blacks always cry foul when a white cop kills a black person, and then threaten violence to innocent bystanders by rioting and beating up any and all white people in their path when the verdict doesn't go their way??? Does this make sense? Can you imagine if white people did that? What about when a black cop kills a black person, or even a white person? It's crimminal the way blacks retaliate and yet it's accepted. As i watched the people being pulled out of their cars, and that poor innocent truck driver beat to a pulp by black protester during the Rodney King ordeal, I just wonder if they even have a conscience. You cant cry racial attack then turn around and racially attack innocent people that had nothing to do with the incident just because they are white. When is society going to see that blacks hate whites and discriminate far more than whites. I was not part of the slave trade, and many of my family died in the Civil war, but I have yet to have any black person come up and say, "hey, thanks for your family dying for our family".